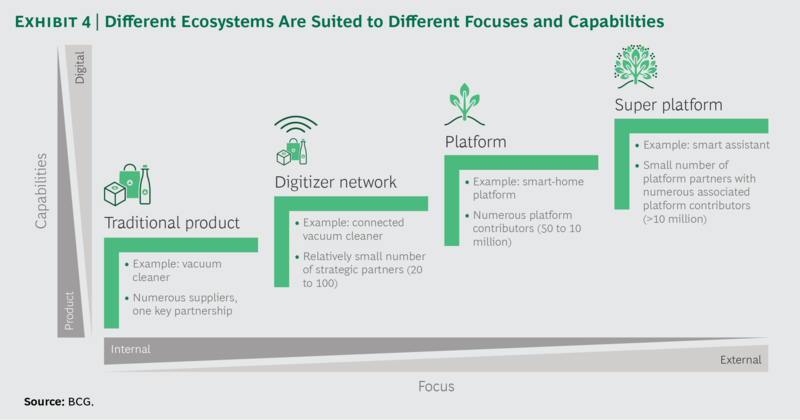 Complex ecosystems are emerging across the business landscape. As our homes, phones, and cars become increasingly “smart” and connected, complex ecosystems are emerging across the business landscape. Companies today must work with a far wider range of partners to pull together underlying technologies, applications, software, and services. Some large, complex ecosystems have a million or more partners working together at different times. And it’s not just the tech industry that’s undergoing these changes. All industries – including traditional ones such as banking, healthcare, consumer products, logistics, and automotive – are seeing an evolution of their products and services, and a need to collaborate differently. This new reality can be especially challenging for large, established players, many of which are used to going it alone. Their preferred approach will often be to try out new things in-house, or to buy a company in order to enter a new space. When they do set up partnerships or make acquisitions, they often end up with an ecosystem more by accident than by virtue of long-term strategic planning. A better approach is to actively participate in shaping the new landscape. To this end, many leading companies are building their own collaborative networks and/or joining existing ones. The challenge is how to effectively set up and manage these ecosystems so they optimize value and confer a competitive edge. 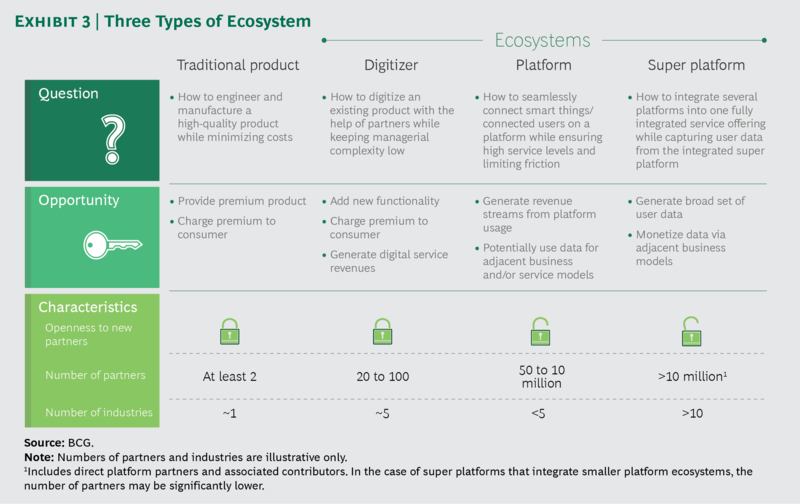 Our analysis of more than 40 ecosystems across eight industries revealed three primary types: digitizer network, platform, and super platform. The right choice depends on a company’s main strategic focus as well as its existing capabilities. If the objective is to digitize an existing product with the help of partners, while keeping management complexity low, the digitizer network is appropriate. This is best suited to companies with strong product capabilities and less need for external partners. A typical example is an automaker that forms partnerships to access the technology and IP needed for connected cars and related digital services. Digital products tend to command a higher price and can generate revenue from related services. The most successful digitizer networks have an advanced product or service to start with, are able to integrate advanced hardware and software into the product, and lock customers in by offering desirable features that build loyalty. The platform ecosystem is appropriate for companies that want to seamlessly connect smart things and/or end users. Although some non-tech companies have begun to join this type of ecosystem, established tech players and tech startups are more likely to set up a platform as their core business model, given their digital capabilities and openness to collaborating with external partners that have the necessary skills. A good example is Xiaomi (an electronics company that includes smartphones, mobile apps, laptops, and other consumer electronics) and its smart home platform, whose many “contributors”, or device makers, add a variety of smart, connected products, such as air purifiers, scales, and rice cookers. The value of a platform tends to increase with the size of its community, since only a large number of contributors and users can create an efficient and consumer-centric exchange. The number of partners varies by platform type. E-commerce, streaming, social media, and sharing economy platforms tend to have thousands or millions of collaborators. Industrial Internet of Things (IoT) platforms, such as a smart city or smart mining platform, can have hundreds of partners. Different platforms make money in different ways. E-commerce platforms usually take a percentage of the transaction value, as do asset and labour-sharing platforms. Social media platforms collect ad revenue or use other data driven business models. Streaming platforms typically charge a rental or subscription fee, while smart cities and other industrial IoT platforms collect a fixed or usage-based fee. Companies that want to integrate several platforms into one fully integrated service offering, should choose the super platform. A good example is a digital assistant that integrates transportation, payment, shopping, and communication services into a single user-friendly solution. To succeed with this option, a company should have advanced digital capabilities, an openness to working with outside partners, and a solid platform to start with. For these reasons, it tends to be the choice of established tech companies. Super platforms depend on a high volume of users driven by a limited number of well-established partner platforms and their numerous contributors, which may number in the millions. As a result, super platforms are open – even to competitors, if they can add unique features. Since super platforms have relatively few platform partners, the lead company can negotiate the strategic aspects of the ecosystem, such as data sharing, exclusivity, and any changes to the platform that affect services or functionality. Another key focus is to drive user engagement. Both Amazon Alexa and WeChat, two established super platforms, offer highly intuitive user interfaces that draw on extensive user preference data from the companies’ other businesses. A super platform makes money largely through adjacent, mostly data-based businesses, such as ads, e-commerce payments, and new service offerings. A good example is WeChat, which started as a social messenger and now allows users to buy and sell products, send money to friends, order food and groceries, and check news. Still, a strong financial backbone is needed to grow a super platform. Amazon launched an extensive marketing campaign to promote Alexa and discounted speaker prices to bring in users. It also gives programmers financial support and incentives to develop skills that continually increase Alexa’s usability and appeal. Many companies use more than one type of ecosystem at the same time. Amazon Alexa uses all three: a digitizer network to improve the hardware and voice recognition of its smart speaker; a platform for adding applications and skills that increase Alexa’s service offering; and a super platform that integrates other platforms – such as Sonos smart home – to increase Alexa Voice Service’s breadth and usage. In today’s connected world, industry and geographic boundaries are becoming meaningless. The new approaches to collaboration outlined above have a different purpose, structure, and outcome than those of the past. They’re marked by the geographic diversity of participants, a cross-industry focus, shorter and more flexible deal structures, and continuous value creation by and for members. These ecosystems are more adaptable, designed to respond more quickly to evolving demand patterns, customer preferences, and the competitive landscape. The new art of setting up and managing these broad collaborative networks, and leveraging their potential, is still uncharted territory for most businesses. Forward-looking companies that can capitalize on the potential power of ecosystems will reap enormous benefits and be better positioned for an uncertain future.